Only have part of this one. I don’t normally remember dreams, so I actually have to try to remember to remember them if you know what I mean. Problem with that is that it wakes me up, and I can use all the sleep I can get. So this is just a fragment. My wife is cleaning up, trying to get rid of the stacks of books that grow around the house. She hands me a pile and asks if I can take these in to my office, as there really isn’t any room here, at home. 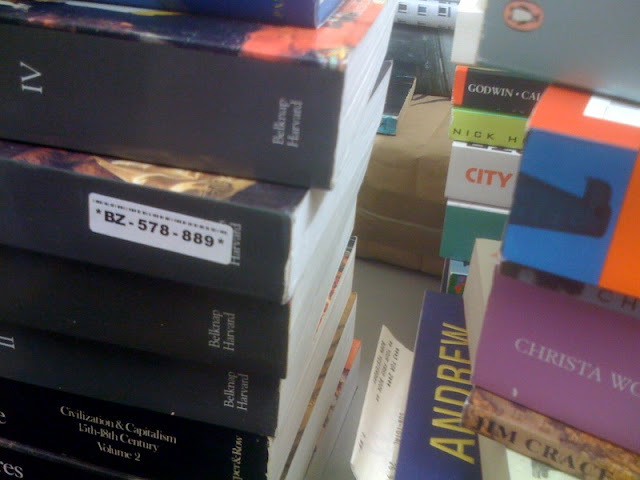 There isn’t any room in my tiny office either – stacks have started to grow on the floor there too. The books that she hands me are odd, though. They are all from the same publisher – HBJ, actually – and all have the cover design that they employed back when my wife and I were undergraduates. Americans, at least those of a certain age, will remember this design from editions Woolf’s work published during the 1990s. I flip through the books, but don’t recognize any of the titles. Zizek on Woolf? Hmmm…. Others are novels I haven’t heard of, by authors whose names I don’t recognize. I can’t remember the titles now, but they seem to be English, rural, woodsy, Wessexy or Essexy. Mid-century or modern-day updates of all of those Hardy novels that you haven’t read and probably won’t ever. Notes: I almost brought home The Waves to read last night, but decided on Ballard’s The Drowned World instead. Never got to it, but in the course of the evening went looking for anything by Mary Gaitskill after reading this in The Nation. While I was looking, I found two more copies of The Waves, one with the new HBJ cover and one with the old – the one my wife used in her “Woolf and Shakespeare” course back at college. The changing cover designs of novels map generational change in literature departments. When I was in college, we had those black framed Penguins, while the older profs still sometimes carried around the dayglo orange models, pages falling our, held together with tape and rubber bands. I am sure that at some point I said to myself One day you will be carrying around this copy of Madame Bovary and your students will have the new edition and it will mark you as old and they will think about you when you were at college, what you were like, and so on. I am not sure what the whole making up / distorting titles thing is about in my dreams. I know that I’ve done this forever. One of the first professors I worked with in grad school, a year-long visitor from out west, a Heideggerian comp lit theorist of the old school, who didn’t much like my work and with whom I’ve never since been in touch despite the fact that the book I’m writing very clearly originated in the work that I did in his seminar, did once tell me a story, not a very good one, platkafka or bassoborges, that when he was in grad school he became convinced that there was this book that he couldn’t find in the library, that he needed for something he was working on. He couldn’t remember the title or the author, but knew it existed and so spent days and days scouring the library looking for the work in question. You can sense the ending, no? Finally he realized that the book didn’t exist, at least not the way he had been thinking. No the book he was looking for was his own book, the one that he was writing, had to write. Harumph. I am glad that I dream about other peoples’ books, and that I know they don’t exist, as I don’t really have time to look for them. I had a similar experience to your grad school professor, only it wasn’t a book I found myself looking for, but a quote from a book. I became convinced that I had read somewhere in Zizek of a Monty Python sketch that it “belonged to a tradition of misanthropy in English literature going back to Swift” – or something of the kind. He may well have included other writers in this “tradition”, like Orwell or Donne. The more I thought about it, the more important it seemed to become, the more its seemed to expalin, and I spent a good deal of time looking for the quote. In fact, I’m still not entirely convinced it doesn’t exist. Ha! In a sense, that famous quote about it being easier to imagine the end of the world than the end of capitalism is a non-imaginary version of all this. It’s Zizek, right, but I’ve only been able to find it in a damned New Yorker article, and in paraphrase. And then some say that Zizek borrowed it from Jameson. It sounds like both! No origin! There’s an experience very common to users of nitrous oxide–: one is working out in one’s mind or reading in a book a concept that will make “everything” come clear, the word of words, the ur-concept, total aletheia. . . But no one ever gets that far, of course, since the experience indexes a brain dying from lack of oxygen. The password primeval is death. My wife got to toke up on NO during delivery – they do that here. Then she cussed out the (male) midwife that was in the room and I had to keep making the calm down signal with my hands. She did overtoke at one point and sort of went blank and euphoric at one point. I’ll have to ask her if it was like that. The word “death” did come up in subsequent discussion…. “Bookstacks” – reminds me of the brickstacks in Goodbye To All That. Did you read that copy of Vollmann’s Europe Central? No! This is a stack of unread stuff, recently transported by me from home to office. I wonder when I’ll get to read that. Have you? Looks good, though impossibly long. Yes, I thought it terrific, though (a) I’m a Vollmann fool and (b) I’m a Shostakovich fool, so it was a happy confluence for me, so take my recommendation fwiw.